The Plantation at Leesburg is a luxurious gated community for those 55 and better in Leesburg, Florida. This gorgeous community has attractive landscaped grounds, cascading waterfalls, lush palm trees, a 24-hour staffed security and fabulous amenities. This 55+ community is the perfect setting for active adults to enjoy recreational and social activities all year round. Residents enjoy the three well-equipped multi-purpose clubhouses, three swimming pools, an on-site restaurant, spring fed fishing ponds and more. The community is a golfer's paradise with two 18-hole semi-private golf courses and two PGA professional assistants on staff. Construction began in 1987 and was completed in 2008. It is located just six miles south of the heart of Leesburg, a lake front town situated on Lake Harris, one of the largest lakes in the chain of lakes in the Lake County, FL. The mild temperatures and natural beauty of this area make it a popular retirement destination for active adults. There are numerous shopping malls, grocery stores, doctor offices and hospitals all within minutes of this active adult community. The Plantation at Leesburg offers its residents three large clubhouses. The Manor, a majestic clubhouse, overlooks a large swimming pool with a scenic view of a beach and a small lake. Ashley Hall has an Olympic sized swimming pool and several sports courts. Hermitage Hall has a semi-enclosed swimming pool and hot tub. All three clubhouses provide diverse activities and social functions for the residents. There is a newly renovated fishing dock and several large marinas in the immediate area. Over thirty-one parks and a dozen marinas and fish camps are also just a short distance from this 55+ community. The clubhouses provide the perfect place for resident to gather with friends and neighbors. A billiards hall, social space and two fitness centers are an ideal way to stay active. Surrounding the clubhouses are a variety of outdoor attractions such as tennis, pickleball, horseshoe, basketball and bocce ball courts. There is also a community softball field and scenic walking and biking trails that meander through the neighborhoods of The Plantation at Leesburg. This active adult community has two semi-private Championship Golf Courses staffed with PGA staff and assistants. The Otter Creek Golf Course sits on the banks of the Palatlakha River. The Cranes Roost Golf Course setting is the picturesque rolling hills of the Florida Highlands Ridge area. Both golf courses are semi-private, meaning residents have preferred rates and tee times. There is a pro shop and a full service restaurant available to residents. The Plantation of Leesburg boasts of 2,820 well-constructed single-family homes ranging in size from 1,308 square feet to 2,958 square feet. The developer designed these quality homes with extra storage and screened patios. Some homes have three-car garages, private pools, and a view of the water or the golf course, privacy hedges or corner lots. There are thirty neighborhoods within the community, all beautifully maintained and inviting. There is a wide range of architectural styles and prices of these quality resale homes. Home buyers will find reasonably priced concrete block homes, framed homes with siding or manufactured homes available. Each resident pays a low monthly homeowner's fee. This fee pays for the 24-hour staffed security gate, upkeep of courts, pools, the grounds and common areas, the entrance and landscaping of the many boulevards, full time activities directors and events that take place. Active adults will find The Plantation at Leesburg, FL the perfect place to enjoy retirement. The beautifully maintained community allows residents diverse social activities, classes and recreational opportunities to choose from. Three full-time activities directors work in this 55+ community. They oversee activities such as arts and crafts, darts, billiards, men and women's exercise classes, ballroom dancing, baseball, softball, bocce ball and the list goes on. Regular club meetings are popular at The Plantation. Clubs such as drama club, computer club, paw print dog club, republican club, astronomy club, democratic club, book club and lots more take place on a weekly basis. In fact, over 100 clubs meet weekly at this active adult community. The Plantation of Leesburg is located in one of Florida's fastest growing areas. Situated just off the Florida Turnpike near Interstate 41, this active adult community is a short thirty minute drive from Orlando's international airport, outlet malls, world famous theme parks and museums. Active adults can invite their grandchildren to visit Sea World, Universal Studios, Disney World and Epcot Center with them. Ocala, home of the glass bottom boat and Ocala National Forest, is also nearby. 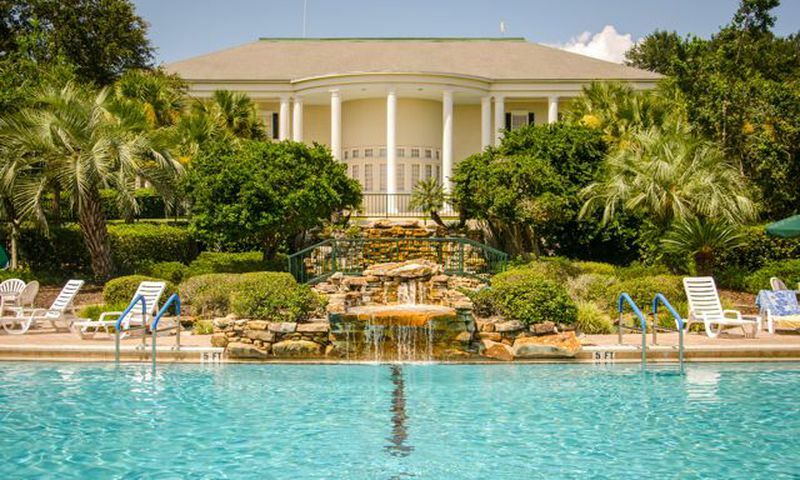 Several popular Florida beaches are just an hour away from this 55+ community. A free shuttle service is available to residents for easy access to local areas. The Plantation at Leesburg is just minutes from local shopping, medical facilities, restaurants and houses of worship. Central Florida is a fisherman's paradise with dozens of lakes, marinas and fish camps available. The Grand Manor clubhouse is the main clubhouse in Plantation at Leesburg. The Heritage Hall clubhouse offers great amenities both in the clubhouse and outside the clubhouse. Ashley Hall hosts numerous clubs and community parties at Plantation at Leesburg. There are plenty of activities available in Plantation at Leesburg. Here is a sample of some of the clubs, activities and classes offered here. The Plantation at Leesburg offered a wide variety of models. Homebuyers can choose from resale homes that include everything from affordable manufactured homes to more upscale frame-built homes and even reliable concrete block homes. There are 30 different neighborhoods in Plantation at Leesburg and each offers slight differences in association fees and level of maintenance. Please Note: Not all floor plans are available. I agree with the comments from the previous reviewer 100%. The community is very clean and well maintained. You can see the pride of ownership throughout the community. I would add the homes here are a great value. Prices are reasonable and the monthly fees are low considering how much is included. Most of the time "You get what you pay for" and sometimes less, but here but at Plantation you get even more. Nice homes, clean and safe community, great amenities, friendly neighbors. Couldn't ask for more! We had traveled extensively around the USA before deciding to retire from the Boston, MA area to the Plantation. You can find fantastic amenities at different communities but the one thing you must consider in where to retire is the financial solvency of the community itself. The Plantation has it all from Archery to Zumba, 2 18 hole golf courses, all for a fee of $85.00 per month ($170 for lawn maintained villages where they mow, trim, fertilize, etc.). The $85.Mo fee has remained the same since 2007 to present (2012) RESIDENT OWNED. There are About 2800 home in our gated community and even the "oldest streets" are clean and neat. 55places.com is not affiliated with the developer(s) or homeowners association of Plantation at Leesburg. The information you submit is distributed to a 55places.com Partner Agent, who is a licensed real estate agent. The information regarding Plantation at Leesburg has not been verified or approved by the developer or homeowners association. Please verify all information prior to purchasing. 55places.com is not responsible for any errors regarding the information displayed on this website.